“I arrived in Dakar, Senegal to an early morning rain. The rainbow never looked better as it marked the start of what turned out to be a great visit. My in-country hosts were there to meet me with a warm welcome into a world like no other. The country office hosts were an exceptionally caring team that made me feel at home in minutes. 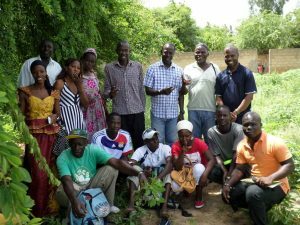 I was there to develop a syllabus and teach a course on weed management with special emphasis on nutsedge at the Horticultural Initiation Center (CIH) in St. Louis, Senegal. This assignment was my first with Winrock and to West Africa. At the school, we found very eager principal, teachers, and students ready to learn new skills and apply them right away. Schools were closed around the country and it was commendable that they would spend two weeks back on campus to review their curriculum in preparation for the new school year. We collaboratively produced a digital catalogue of local weeds. 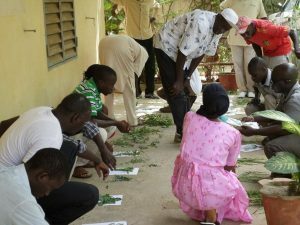 Thanks to Suleyman Diallo, a research scientist with the National Agricultural Research Institute, ISRA, we made a digital catalogue of all the 25 weeds found in the center’s garden with both scientific and local names. One of the techniques learned was to use animals for weed suppression in the vegetable gardens. Everyone had a chance to design a chicken tractor and one of the trainers took the lead as he also had experience and a local business making hen houses from recycled tin cans. The days were busy with classes in the morning, which started with hands-on exercises and followed with lectures. The later part of the day was spent reviewing material with Pape Tall, the Winrock program manager who translated it into French and helped in delivery. 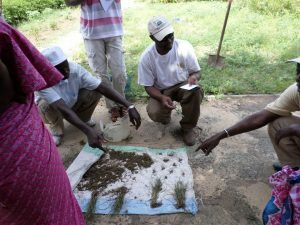 We also reviewed the hands-on activities and tools with the principal, Demba Diop. The days went fast and I cannot help but marvel at the amount of work we covered.